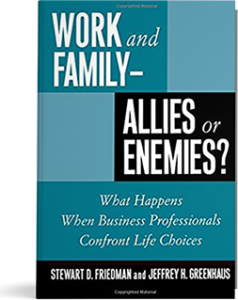 Work and Family – Allies or Enemies? The Wall Street Journal selected Work and Family – Allies or Enemies? as one of the best books in the field when it was published in 2000. The groundbreaking research vividly described in it was based on data collected on over 800 business professionals in the 1990’s by the Wharton Work/Life Integration Project’s study of Wharton alumni and a parallel study at Drexel University by Jeff Greenhaus and Saroj Parasuraman. Well ahead of its time, Allies or Enemies? brings to life what the academic literature and our evidence showed about the dilemmas of integrating work and personal life and addresses what employees, their organizations, families, and our society can do to develop creative means for handling these challenges. We can have (much of) it all, but it’s especially tough for working mothers. Work and family can be allies. Time is not the major problem. Authority on the job is essential for work-family integration. Women may be better adapted for the jobs of the future. Kids are the unseen stakeholders at work. 2002. Book review. Administrative Science Quarterly, June, 358-364. 2002. Making work your family’s ally. APA Monitor, July/August. 2002. Creative destruction, family style. The Intercollegiate Review, Spring. 2001. Book Review. Academy of Management Executive, May, 139-141. 2000. This Year’s Picks on Work , Family, Advice, and Self Help. Wall Street Journal, December. 2000. Life’s work. CIO, October 16. 2000. Book Review. HR Magazine, July. 2000. Work and Family: is peaceful co-existence possible? Knowledge@Wharton, April 26. For press on other topics. Sign up to get our newsletter and instantly download a slide deck that describes the Total Leadership fundamentals.